In the 18th Century, Homma, a Japanese businessman and merchant specializing in the primitive futures market, developed a method of visual analysis to understand the price of rice contracts known as 'candlestick' charting. This charting system is used extensively in modern Foreign Exchange (FOREX) markets. The candlestick charts a visual display of the high, low, open, and close for a security each day during a specific period of time, in a way similar to a bar chart, but with a fashion that better shows the relationship between the opening and closing prices. A small line jutting from the top or bottom, the shadow or wick, shows the periods price range. A wider body marks the area between the open and the close, referred to as real body. If the close is above the open, the body is white or green (not filled); if the close is below the open, the body is black or red (filled). Because of the nature of the chart's layout, information is able to be parsed at a faster and more intuitive rate, letting the user spend more time spotting trends and picking up on nuance, than trying to understand the basic relationships. A related charting is the Kagi method. The Kagi chart is a chart used for following price movements and to make decisions on purchasing stock or other commodities with a shifting price. It departs from traditional stock charts, such as the Candlestick chart by being mostly independent of time constraints, using only demand and price. This feature aids in producing a chart that reduces unhelpful extraneous information. Thick lines are shown when the price of the asset moves above the previous high price. This is shown as an increase in demand for the commodity. Thin lines are used to represent increased supply or decreased demand when the price falls below the previous low. One important note about these charts is that they do not rely on or show time tracks, and only changes direction once a predefined reversal amount is reached. As a general rule, when a kagi chart has made eight to ten higher highs, the market is considered to be due for a correction. Financial expert Steve Nison is credited with popularizing both candlestick and Kagi charting in the Western World and is seen as the leading expert on their use and understanding. He is the founder and President of Candlecharts.com which provides premier educational products and advisory services. 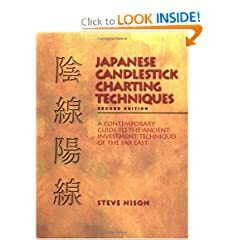 Nison is the author of "Japanese Candlestick Charting Techniques", a book detailing the fundamentals of the Candlestick Chart, as well as "Beyond Candlesticks", a book detailing the art and use of the Kagi Chart, both well received books detailing the uses and interpretation of the charts. He has appeared numerous times on CNBC, and his segment on FNN, the precursor to CNBC, brought in the most viewers that network ever recorded.